In conjunction with Delta State University’s fifth annual Delta Mayors’ Summit on June 19, Delta State President William N. LaForge and Mississippi State University President Dr. Mark E. Keenum hosted a press conference to announce a partnership between the two universities to benefit local government leaders. The new program, termed the Local Government Leadership Institute, assists and supports local officials of the Mississippi Delta in addressing governance challenges by providing activities, basic training, and helpful tools to assist them in running their municipalities effectively and efficiently. Since November 2017, the Local Government Leadership Institute, in partnership with the John C. Stennis Institute of Government and Community Development at Mississippi State and the Mississippi Municipal League, has provided training for more than 130 elected leaders across the Delta. These leaders represent nearly 35 Delta cities and towns. Through the Leadership Institute, participants have collectively earned more than 225 Certified Municipal Officer elective hours offered by the Mississippi Municipal League. “I am very grateful to MSU President Keenum and the MML leadership for joining with us in an enterprise we believe can be transformational,” added LaForge. Keenum echoed LaForge’s praise for the program. LGLI seeks to cultivate more knowledgeable, skilled, and effective municipal leaders and managers; improve local government services and environment for business, education and citizens; enhance community relations; increase public trust in local government; advance public civility and racial harmony; and, improve the community’s economy and quality of life. The program is under the direction of Dr. Temika Simmons at Delta State University. “We believe that well-managed local governments are important not only to the citizens they serve, but to the businesses, industries and other institutions that are located in those communities,” said Simmons. “The leadership, management and infrastructure provided by local governments are key elements in a community’s delivery of services and quality of life efforts. As a civic and institutional partner, Delta State University is committed to providing the support needed by our local elected leaders as they continue their work to strengthen and grow the Mississippi Delta jewel that we call home. Simmons reiterated that the program is made possible by generous support from the Robert M. Hearin Foundation, Casey Family Programs, and the collaborative relationship with partners at the John C. Stennis Institute at Mississippi State and the Mississippi Municipal League. Delta counties served by LGLI include: Bolivar, Coahoma, Sunflower, Washington, Issaquena, Sharkey, Quitman, Tallahatchie, Leflore, Humphreys, Yazoo, Warren, Desoto, Tate, Tunica, Panola, Carroll, and Holmes. Dr. Dallas Breen, executive director of the Stennis Institute, is looking forward to improved education and training opportunities as a result of the institute. “Working collaboratively, Mississippi State and DSU, along with partners like MML and others, are leading the way to greater educational attainment and economic opportunity for all Mississippians through innovative programs like the Local Government Leadership Institute,” said Breen. MML Deputy Director Robbie Brown is also thrilled by the institute’s impact. 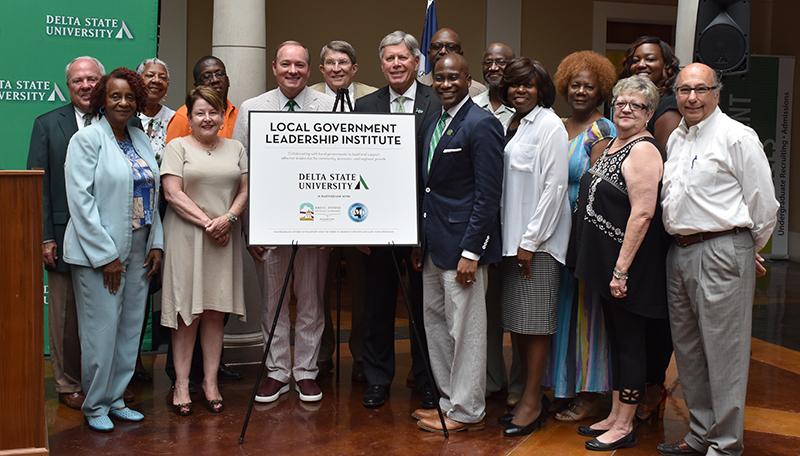 For more information on the Local Government Leadership Institute, visit http://www.deltastate.edu/cced/local-government-leadership-institute/ or contact Simmons at 662-846-4254.